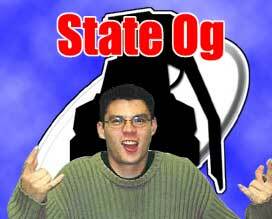 It's State Og Saturday Saturday Saturday moreso than usual at Something Awful as in addition to the usual State Og update we got the front page as well. What does that mean? Well, my bit is on the front page twice (1.23.2003 and 1.30.2003) and I have two more in the weekly article (Making Mail Safe and Extremely Extreme Sports). Now that is more State Og than you can shake a stick at, though I really don't think you should be shaking a stick at Og unless you're looking to catch a ballistic missile. As for this particular site, expect updates galore once I finish up some other stuff (read: laziness). In the mean time, I sharpened my Internet goon claws that the ladies go nuts for on Davin's face this morning, provoking a decent response for once, and I'll be plum cotton jiggered or whatever if I haven't archived it for the amusement of all.